A pellet stove heater can be an elegant and attractive addition for your home. They work by being powered by electricity, but heating by burning wood, which can bring your energy costs down as well as providing you with a traditional and effective method of heating your home, room or building. There are many great pellet stoves for you to choose from with different styles too. Thanks to the various options that you can choose from, there is a pellet heater that is suitable for any home. 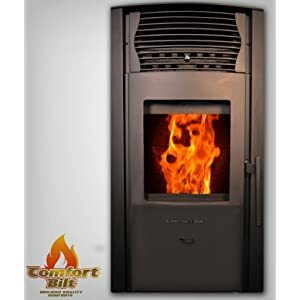 Read these best pellet stove reviews to find out which would be the best pellet stove for your home. We’ve also added our 2 best pellet stove inserts below the stoves. 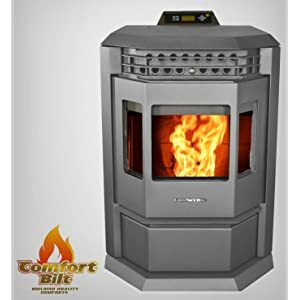 Whilst installing the pellet stove heater may cause some problems, and requires a lot of labor, it is certainly worth owning a pellet stove as they provide effective convection heating whilst being capable of providing enough heat for large spaces. 3.3 What Is a Pellet Stove? This high quality pellet stove has a 50000 BTU output. It is great for larger rooms and buildings as it can heat a space of up to 2200 feet. It has a 120 pound capacity hopper that when full can provide around 24 to 70 hours of continual heating to your room. For complete convenience, this pellet stove has an auto-light ignition. Within just seconds, this heater is on and ready to heat your room. You can choose from 5 different heat settings, which is sufficient when you simply want some control with your pellet stove, although some people may prefer a more precise thermostatic control. If you wish to choose the setting, this heater can run continuously without problems on the min or max heat temperatures. It also has a comfort control system to ensure that your room is kept to its optimal temperature at all times. This attractive heater has a spring chrome handle and a solid cast iron door with a glass viewing window. It also has an air wash system to ensure that the air stays as clean as possible. This heater comes with a 5 year limited manufacturer’s warranty. This is much longer than most heaters offer you so that you can enjoy complete peace of mind. This powerful Comfortbilt Pellet Stove HP22 has a high 50,000 BTU energy output. This makes it suitable for heating particularly larger spaces. 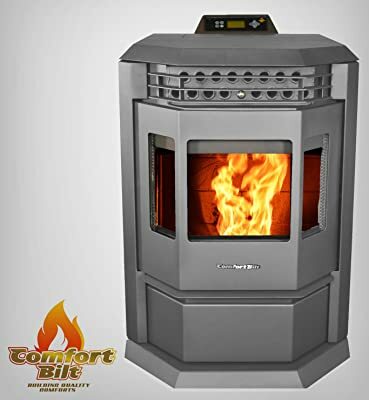 It uses a convenient push button auto ignition and you can make the most of the programmable thermostat to set the operating temperature of this heater. A blower circulates the heat around the room, ensuring that it is effectively carried evenly throughout the space that is being heated. This pellet stove has a hopper capacity of 55 pounds. This can provide you with over 12 hours of continuous operation. For convenient cleaning, the ash pan can be removed with ease. A large viewing window and the attractive design make this pellet stove a popular choice. You can easily control the temperature of this pellet stove even if you are not sat near it as it comes with a remote control. This is also a quiet heater that you will barely notice running in the room. For complete peace of mind, you can enjoy a 1 year limited warranty. This protects you against manufacturer’s faults in the first year. Whilst this isn’t as attractive as some other manufacturers offer, you can be sure that this stove will last a long time, thanks to its durable construction. This is a low cost pellet stove that can save you money on your heating bills in the long term. The Comfortbilt Pellet Stove HP50 has a 42,000 BTU energy output. It is a suitable choice if you want to heat a space of up to 1,700 square feet. It is a good heater for the home market. This heater has a massive 47 pound hopper capacity, which is one of the largest sizes of hopper available. This will last for days before you need to refill it again, even with continuous use! This is a good heater as it has an 86.2% burn efficiency rating and it is fully certified for your safety. It has a robust design that will last for many years as long as you follow the maintenance and care guidelines. You can also enjoy a 1-year manufacturer’s warranty when you purchase this heater, which will protect your purchase against any manufacturer’s faults. This attractive heater is available in a charcoal grey color and it will fit nicely into most home designs. It produces a great flame pattern, which is visible through a glass viewing window. This is a great focal point that you can choose to add to your room to add class and elegance. This is an unusual pallet stove, as it is wall mounted. It is an energy efficient heater that not only saves money, but it can also save space in your home too. If you don’t have the room to keep the stove on the floor, then the US Stove Company 4840 Pellet Stove is for you. It can also be a preferable choice for families with children or pets as there is less chance of them getting injured from the stove if left unsupervised. You can also forego the need to have a hearth installed, which will save floor space in your home. This is a smaller heater that is perfect for the home market. It has a 24,000 BTU energy output, which means that you can heat a room that is up to 1000 square feet in size. The hopper has a 28-pound capacity, which will last you for several days before you need to refill it. The heater itself has a blower that allows heat to be effectively circulated throughout the room. A thermostatic dial allows you to choose from 5 different heat settings and this heater has an automatic ignition for your convenience. The beautiful Castle 12327 Serenity Wood Pellet Stove is the perfect addition for many homes. It is a charcoal grey color and has a large glass viewing window to enable you to see the flames inside the burning chamber. This stove has a digital display that allows you to control the stove with ease. It has an automatic ignition to make starting this heater as simple as possible. You can also choose from 5 different temperature settings. There are also 5 different blower speeds so you can control the intensity of the heat in your room. This heater is suitable for smaller rooms and buildings, such as the home. 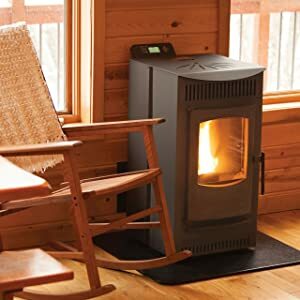 It can heat a room of up to 1,500 square feet and has a burning efficiency of around 78%, which is good for pellet stoves, but not the best that the market has to offer. If you are concerned about safety, you’ll be pleased to know that this heater has been fully EPA certified so you can rest assured that you can enjoy completely safe operation. This pellet stove is a practical option, but you can also enjoy the aesthetics that it provides too. It is bound to be a great addition for your home. 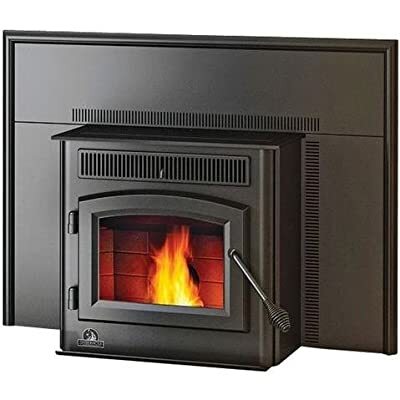 The stunning Napoleon Tpi35 Direct Vent Pellet Insert stove is a high quality fireplace insert that is sure to impress when you install it in your home. If you have an existing fireplace, you can install this pellet stove and make use of your chimney. 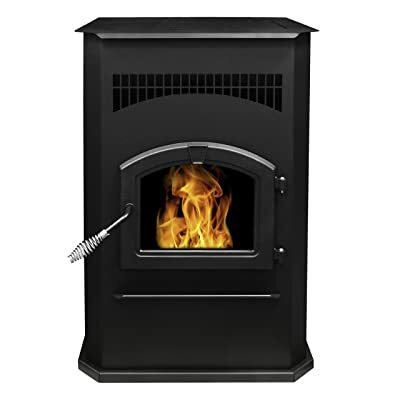 This will save you money when it comes to installation, and you can avoid many of the obstacles that can arise when you choose to install a freestanding pellet stove. The sleek black finish of this stove gives it a charming look, which is suitable for matching with your existing d??cor. The door matches the insert surround and the viewing panel allows you to see the flame as the pellets burn within. This panel has a digital control panel that allows you to operate the air wash function with the touch of a button to ensure that you can enjoy clean and safe air in your home. The 120 CFM bower fan effectively and evenly distributes the generated heat around your room, creating a cozy and warm atmosphere. This is an efficient pellet stove that is not only good looking, but it also offers durability and longevity. With the proper care and maintenance, it could last you for many years. The BRECKWELL BLAZER SP24I is a direct vent pellet stove insert that can be installed into most existing fireplaces. This stove has a large 60-pound capacity hopper for storing the wood pellets, which is cleverly concealed thanks to a stepped top back design. The auto ignition makes starting this stove as simple as possible. With the press of a button, you can enjoy a warm room. This is a powerful 50,000 BTU output heater that is suitable for warming rooms that are up to 2,200 square feet in size. For complete customization, you can choose from a number of surround designs. This allows you to choose different sized flashings for larger fireplace openings. You can also choose between a gold or nickel finish doorframe. The viewing window allows you to enjoy the flame as the pellets are burning and the neutral color of the appliance ensures that this stove will fit well into most homes. 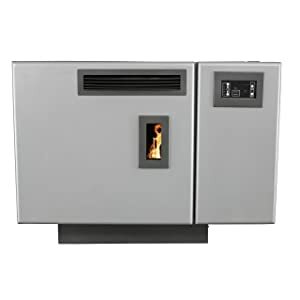 An electronic LED keypad allows you to easily alter the operating temperature of this heater. You can choose to run it with or without the thermostatic controls. You can also choose from 5 different operating temperature settings if you wish to control the temperature in your room. A pellet stove is a convenient heater that looks attractive, and can also provide adequate heating for a room or building. You should always look at the best pellet stove for the money that you are willing to spend. A pellet stove operates with the use of electricity and wood pellets. A hopper at the top or base of the pellet stove is laded with pellets and then a delivery motor sends the pellets into a burn pot. The speed of the motor controls the temperature that the stove operates at. The burn pot is ignited and this chamber effectively mixes air and fuel to create the heat that is needed to warm an area. The wood pellets themselves burn hotter as they are compressed and low in moisture. It is necessary to clean the ash pot of the pellet stove from time to time, as this can become filled with the ashes of the burned pellets. Rather than radiating heat like a normal fireplace would, a pellet stove create s a convection heat current around the room. This is achieved with the use of a blower. A convection current is a much more efficient way of heating a room and less heat is lost. You can enjoy steady and more reliable heat from a pellet stove than with many other kinds of wood burning stoves. 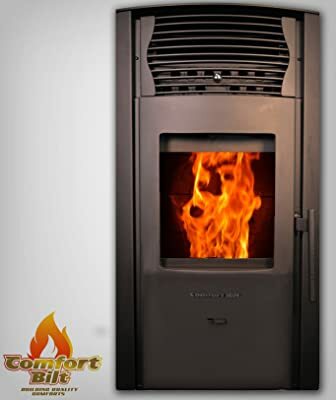 When you are choosing from top rated pellet stoves, there are many things to consider. You should make sure that you choose the best pallet stove for your needs, so use this useful buying guide to make sure that you make the best decision. When you are looking at pallet stoves, you will realize that there are two main kinds of stove to choose from. A freestanding stove can make a great feature point in a room, and is suitable for those rooms that have a little more space. They have their own exhaust pipes, although you must build new ventilation into your home. If you would prefer a more seamless heater and you have an existing chimney, you can opt for an insert stove. These stoves vent up the chimneystack and don’t require any additional ventilation to be made. As pellet stoves come in a range of shapes, sizes, styles and colors, it is possible to find one that fits perfectly into your home. Pellet stoves all operate in the same way, and apart from the power output and aesthetics, you will find that most stoves offer very similar features. Some stoves have a top-loading hopper. These kinds of stove require you to load the pellets into the top of the unit and then the stove transports these pellets down into the burning chamber when it is heating your home. This design can be very safe, as it doesn’t allow the delivery tube to set on fire, however the delivery tube can sometimes become blocked. These stoves however usually have more efficient burning chambers. 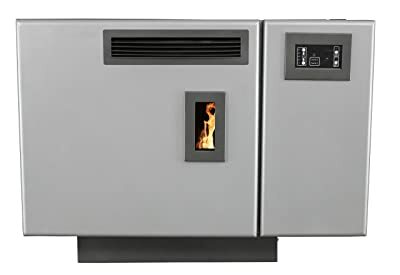 The other kind of pellet stove has a side or rear-loading hopper. The horizontal movement of the pellets keeps the ash away from the delivery channel and causes less chances of clogging. You can also use slightly lower grade pellets as a result of this, which can save you money. You should think about the area that you want to heat. You should choose a heater that matches the size of your room best so that you don’t waste energy and so that your room will be heated sufficiently. 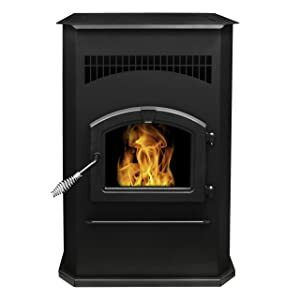 There are two different kinds of ignition that you can choose from when it comes to pellet stoves. A manual ignition uses a gel or liquid starter. These are a more traditional option, but they require a little more work than automatic ignitions. An automatic ignition sparks a flame as soon as you press the ignition button. Wood pellets are easy to store. They do not take up much space, and as long as you keep them in a dry place, they should last for a long time without losing quality. Unlike other fuels, wood pellets are not dangerous, which can be better if you are choosing a pellet stove for a family home. You can operate the best wood pellet stoves safely, thanks to the hopper loading design. Simply load the pellets into the top of the base of the unit, light the ignition, and the heater will start to produce heat. You can easily adjust the temperature of the stove too with the thermostatic control. Unlike other heaters, the fire for the pellet stove is completely encased in the stove itself. This means that you can keep the smell of the burning wood to a minimum. Whilst the smell of burning wood is not particularly unpleasant to most, it can be overpowering in a small room. The encased flame means that the heater itself doesn’t become too hot either. One of the biggest disadvantages of pellet burning stoves however is the price of them. They cost thousands of dollars to purchase, which can be out of many people’s budgets. They also have additional costs of requiring professional installation too. Due to the size of the wood pellets, if you don’t have enough space to store large quantities of them, you may also find yourself making frequent trips to replenish your supplies. Another major advantage of pellet stoves is that they’re not a good heater to have in a power outage. Whilst most homes rarely experience power outages, some locations expect them at certain times of the year where adverse weather conditions are expected. If the electricity supply goes out, so does your pellet stove. Installing a pellet stove requires some careful consideration of a few important points. You will need to have adequate floor protection for a pellet stove. Pellet stoves can produce a lot of heat, and you need to make sure that you protect the floor directly in front of the heater. A hearth will need to be installed to ensure safety. This will need to follow the guidelines for the best material, thickness and size depending on the pellet stove that you choose. You will need to make sure that you can install the necessary ventilation for your pellet stove. There are a few different ventilation options that you can choose from but you need to ensure that there are no obstructions and that the ventilation can be safely carried to the outside of your property. Windy conditions can affect the effectiveness of any ventilation that is in place. You should make sure that you choose the best position for the ventilation outlet that is sheltered from any wind. Homes that are at a particularly high altitude are often most at risk from windy conditions. Ensuring that the stove will be placed away from any potential fire hazards is also a must. You should make sure that there is enough clearance between the stove and other items such as furniture, walls and drapes. Because pellet heaters also require the use of an electricity supply, it is important that you make sure that there are sufficient electrical provisions for the stove. It will need to have the correct voltage for the stove, as well as having a ground and the necessary polarity. The circuit that the pellet stove is on should also have its own circuit breaker that is independent from other appliances to ensure complete safety. You should make sure that you choose a qualified professional to install your pellet stove. You should always make sure that only a qualified professional installs your pellet stove. A pellet stove is not suitable for installation by the DIY enthusiast, as there are a lot of safety precautions that must be followed. It also involves the alteration of chimneys and ventilation, which must be done by a professional. When you purchase your pellet stove, you should check that it has been tested and approved by an independent tester. Pellet stoves are designed to burn dry pellets only. Burning damp pellets can be dangerous so it is important to keep your pellet supply dry. You should use a wire brush to keep your pellet stove clean. Keeping up good maintenance procedures will not only ensure that your stove is safe, but it will also keep it working without fault for longer. 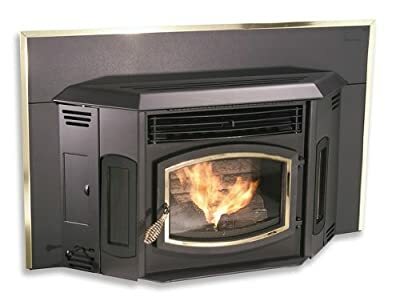 When you are installing an insert style pellet stove or if you are ventilating through your chimney, it is important that you get your chimney inspected and cleaned regularly. This can be done by a certified chimney sweep. You should try to remember to have this done every fall, as this will ensure that your heater is ready to be used for the winter. You must allow the ashes to cool sufficiently before you attempt to clean the ash pan. Ashes must be disposed of in a covered metal container, and stored away from the home. If children or animals will be around the pellet stove, you must ensure that you supervise them at all times. Even if the heater is not turned on, it is easy to ignite an automatic ignition and this can be dangerous. Remember never to obstruct the heater. There should be a generous amount of space around the pellet stove at all times to that heat can circulate properly. Obstructions can cause fires. Pellet stoves are a great way to add an interesting focal point to your home. These best pellet stove reviews give you some ideas for choosing the best stove for your home. We hope that you have also found or guide useful. You should make sure that you follow the installation and safety guidelines when you purchase a pellet stove. Even though these stoves can be very safe and effective, if they are not installed properly, there can be some serious dangers. To keep your pellet stove in the best possible condition at all times, you should ensure that you keep up with regular maintenance and cleaning procedures. You should also remember to have your chimney cleaned once a year to keep the air in your home as clean and safe as possible. Whilst pellet stoves can be expensive to purchase and install, in the long term, they will not only provide you with a great feature for your home, but you can also enjoy lower energy bills.